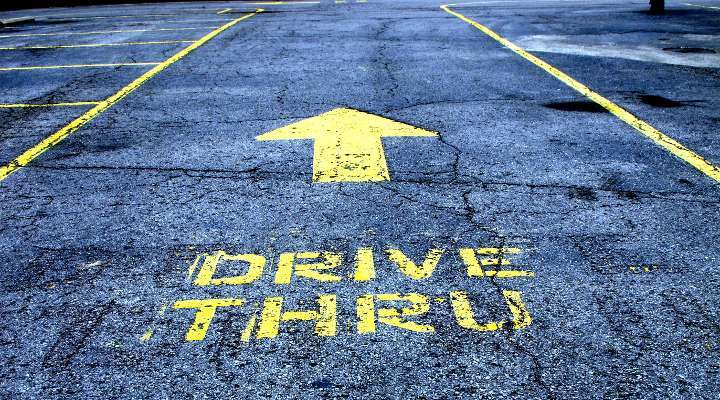 There is general agreement that eating fast food from a drive thru is the opposite of what the Paleo movement is all about. By making meals at home from scratch you know exactly what is going into your food and can control the quality and source of the ingredients. If you are considering supplementing your meals with Paleo fast food options, I would generally suggest making meals in bulk at home or consider one of the great nationwide Paleo delivery services offering frozen Paleo meals in to-go containers using ingredients like organic produce and grass fed proteins. That said, when you are Paleo for a while, the realities of life tend to creep in. It’s one thing if you are doing a Whole 30 or other time limited program, but as you try to incorporate this way of eating into your life over the long term extenuating circumstances are bound to come up sometimes like wanting to meet a friend for a quick bite out. This guide is an attempt to help you find the least bad Paleo fast food options, to be able to put together a truly Paleo meal from the various fast food options out there. A couple of the places on this list may even surprise you, with ingredients that are grass fed, organic and on the whole, truly Paleo if you order wisely. This guide will hopefully make it easier to grab a quick bite on the way back from the gym, or on the day at work where you forget to bring food for lunch, or the many other scenarios that life will invariably throw at you. Chipotle is the darling of Paleo fast food (if such a statement can actually be made of any fast food). Just about every recommendation for Paleo fast food I have ever heard mentions Chipotle…and for good reason. Chipotle is at the forefront of the movement to offer hormone free meat and organic, local vegetables in a chain/fast casual restaurant. Guacamole – Chipotle’s delicious guacamole contains only Hass Avocados (often Organic), Red Onion, Jalapeño, Cilantro (often organic), Citrus Juice and Kosher Salt – that’s it! Carnitas – The carnitas use their pork which they list as humanely raised with no antibiotics or hormones. Also in the carnitas are Juniper Berries, Thyme, Bay Leaves, Salt, Black Pepper, and Sunflower Oil – Sunflower oil being the only ingredient that is not always considered paleo. Chicken – They also strive to source humanely raised antibiotic/hormone free Chicken, cooked with Chipotle Chiles, Rice Bran Oil, Cumin, Garlic, Oregano, Black Pepper and Kosher Salt – Note: Rice Bran oil is not considered paleo so this is something to consider if you are strictly following the diet. Steak – The steak is also usually humanely raised antibiotic/hormone free beef, and even grass fed at some select locations when available. It is cooked with Cumin, Garlic, Chipotle Chiles, Rice Bran Oil, Oregano, Black Pepper and Kosher Salt – Note: Rice Bran oil is not considered paleo so this is something to consider if you are strictly following the diet. Barbacoa – The Barbacoa also contains the beef which is often responsibly raised and antibiotic/hormone free. It also includes Cumin, Garlic, Chipotle Chiles, Rice Bran Oil, Oregano, Black Pepper, Salt, Cloves, Bay Leaves and Sunflower Oil. Note: Rice Bran Oil is not considered Paleo and sunflower oil is a grey area. Fajita Vegetables – This combo of peppers and onions contains Green Bell Pepper, Red Onions, Kosher Salt, Oregano (often Organic) and Rice Bran Oil – Note: Rice Bran oil is not considered paleo so this is something to consider if you are strictly following the diet. Based on the above paleo friendly menu items you could create a paleo vegan/vegetarian salad by asking for a salad with a base of lettuce, green (medium) and/or tomato (mild or hot) salsa and guacamole (I usually pay for extra guacamole to make it a heartier dish). If you are happy with something that is mostly Paleo but contains a little sunflower oil, you can add in pork Carnitas as a protein. If you are ok with a little rice bran oil you can also include the chicken, steak or barbacoa and fajita vegetables. Does Moes Southwest Grill also offer Viable Mexican Paleo Diet Fast Food Options? A number of Paleo bloggers have mentioned that Moe’s touts that they offer grass fed steak and other organic ingredients in their food, which on the surface seem very promising. However, they do not publish the ingredients in their foods, and in the research I have been able to do, it appears that they include soybean and milk ingredients in their grass fed steak during processing. 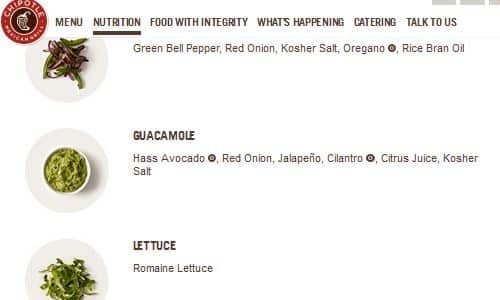 Although Chipotle has made big strides in removing GMOs and improving the quality of their ingredients over the years, I haven’t seen any evidence that Moes has improved since these reports were released. For these reasons, I would suggest skipping trying to eat Paleo at Moe’s Southwest Grill unless it is an emergency or a Paleo cheat day. Sweetgreen is one of the many make your own salad fast food restaurants gaining popularity around the country. One thing that makes Sweetgreen unique is their founding emphasis on local, in season produce from named farms and organic high quality lettuces and vegetables. Many of the fast casual make-your-own-salad restaurants, such as Chopt or Sweetgreen are great places to put together a paleo friendly salad without worrying about whether unknown ingredients will be added. In addition their meals are ready fast, as quickly as you can move through the salad line and pay. Sweetgreen tends to have several different salad bases available, such as arugula, baby kale or spring mix and offers unique toppings such as fresh herbs like basil and cilantro. You do still need to scrutinize the salad bar options as some toppings, typically cooked items, may contain sauces which are likely not Paleo. Your best bet if trying to stay strictly paleo are their numerous fresh raw vegetable salad toppings. 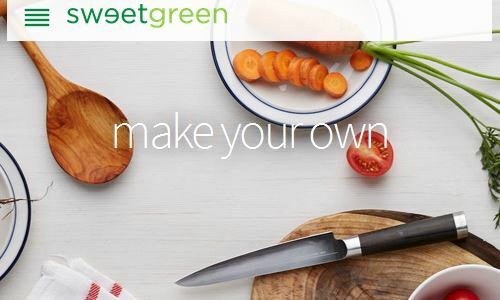 In addition, Sweetgreen will make a custom salad dressing for you with extra virgin olive oil and a choice of vinegars or fresh lemon or lime juice, and fresh salt and pepper (among other choices) so you can feel confident in what is really going into your salad. Note: some of the already prepared dressings have been reported to be Paleo online, but in further research do contain rapeseed oil. Each Sweetgreen store should have a binder behind the counter with specific food ingredients of all items served, so be sure to ask if you want to go with any of their pre-made dressings or other pre-made options. Make your own Salad – A custom salad complete with your own choice of lettuce, baby kale or baby spinach, your choice from a ton of raw vegetables, sliced nuts and others toppings and the ability to create your own custom salad dressing using ingredients you choose. 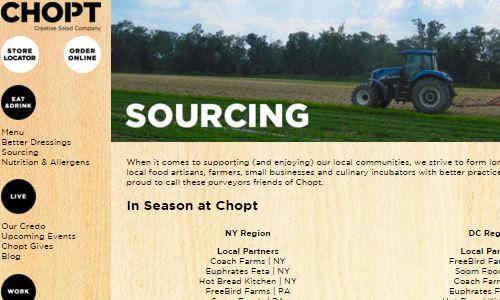 Chopt offers custom dressings and locally sourced ingredients for their custom salads as well. Chopt is another great choice for creating a custom fast food paleo salad. They are predominantly located in the NYC and Washington DC metro areas at this time, with some expansion into North Carolina. They do offer fresh lime and lemon juice as salad dressing options, which may be safer and more Paleo compliant than their pre-made dressing offerings. Generally chopt is another great option for pickup up a fast food Paleo compliant salad. 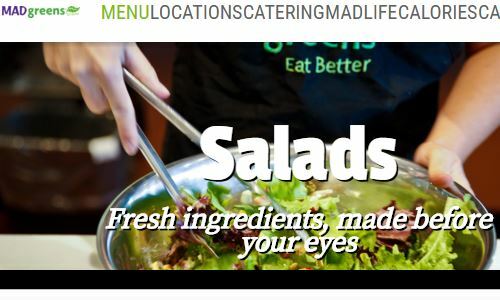 Mad Greens is a healthy salad and juice chain with a large number of locations in the the Austin Texas, Phoenix Arizona and Denver Colorado areas. They offer custom salads which you design as well, which give a great Paleo fast food lunch or snack option. They also offer fresh pressed juices, a great alternative Paleo snack option. 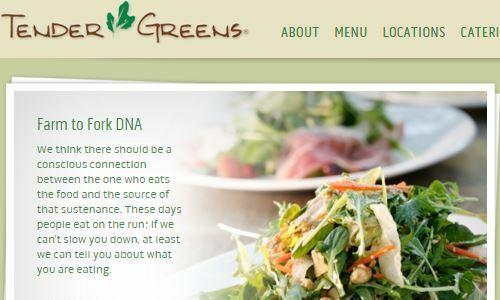 Mad Greens generally strives to use organic and local produce in their salad ingredient offerings, which is promising. A fast casual restaurant chain with locations throughout California, Tender Greens is another great option when looking for Paleo diet fast food options. Given the set menu, which varies by location, it isn’t quite as easy to customize your order to make it Paleo friendly as the other make your own salad chains, but they do offer local, sustainable produce from area farmers and likely will be open to customizing dressings to meet Paleo dietary needs when asked. In terms of fast food Paleo burger places, Elevation Burger is about as good as you can find. 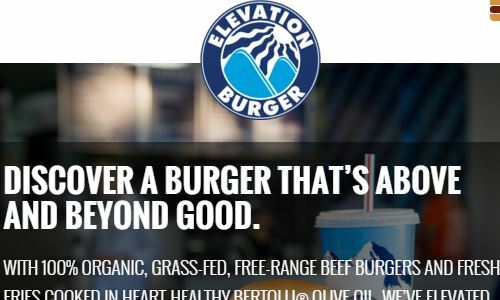 The name elevation comes from their desire of the owner to elevate the quality of fast food burger ingredients, and they have stuck to that mission. 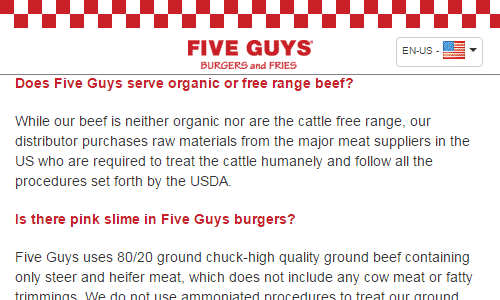 They insist on using 100% organic grass fed beef in their burgers, and cook with olive oil in their kitchen. Elevation burger offers their burgers with an optional lettuce wrap, instead of a bun. With this combination and no condiments like ketchup or mayo, their lettuce wrapped beef burgers are totally paleo. If you order their “virtigo burger” you can order as many organic beef patties as you want, so you can customize the burger based on how hungry you are. Elevation burgers are available in a good number of cities throughout the East Coast, with a couple of additional locations in Texas and the Midwest. They are expanding rapidly, having only started franchising in 2008, so there is a good chance one will be opening on near you soon if there isn’t one already. The Elevation Burger – Ordered with a lettuce wrap instead of a bun. The original elevation burger comes with 2 grass fed beef patties. Some Paleo friendly toppings include sliced fresh tomatoes and sliced raw onions. The Vertigo Burger – Ordered with a lettuce wrap as a bun replacement, the “vertigo” version can be ordered with anywhere from 3 to 10 burger patties, giving you complete control over how filling a meal you order. For those on the west coast, the lettuce wrapped protein style burgers at In and Out can be ordered with topings that make it quasi-Paleo. Although the beef is not grass fed, according to the in and out allergy statement their beef patties contain 100% beef with no fillers, additives or dairy. Single, Double or Triple burger “Protein Style”, hold the spread – The protein style burger is the lettuce wrapped beef patty. It is typically served with a slice of lettuce and tomato. If you order a double or triple you will receive either 2 or 3 beef patties, good for when you are a bit hungry. You will want to ask them to hold the “spread” as well as the ketchup they would normally add to the burger. Some also recommend ordering grilled onions, peppers and mustard, but it is unclear the paleo credentials of these ingredients, so choose these items at your own risk. Five Guys is another higher quality burger chain, which is pretty widely available with over 1000 locations in the US, Canada and the UK. Although there are aspects that are not the best for Paleo eaters, such as all menu items being cooked in peanut oil, they do offer lettuce wrapped burgers and generally offer higher quality beef than most fast food burger places. Hamburger, served in a lettuce wrap – Five Guys hamburger patties are made with a single ingredient, fresh ground 80/20 USDA Ground Chuck. All items, including the burgers are cooked in peanut oil, so for this reason they are not technically 100% paleo, but are relatively close. Note, their bacon does contain sugar, see the list below for paleo friendly toppings. 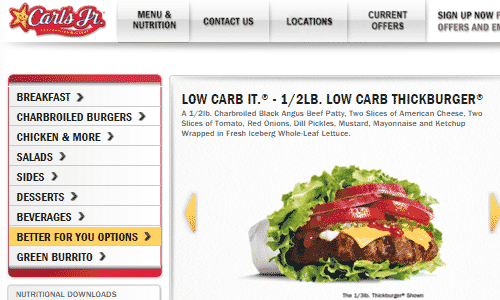 Carl’s Jr now offers a “low carb” burger that can be ordered with a lettuce wrap. Again basically the beef patty with sliced tomato, wrapped in lettuce. In order for this to qualify as partially paleo, you would have to forgo the ketchup, mustard or any other condiment. Carl’s Jr. Low Carb Burger – Carl’s lettuce wrap burger is about as paleo as it get’s at the moment from true side of the highway/drive thru fast food burger places. The beef is not grass fed, but at least is 100% angus beef, aside from some questionable ingredients such as sodium phosphate and “spices” (which can really be just about anything). That said, that is worlds better than the burgers from most other fast food burger places like McDonalds or Burger King for paleo so you are already ahead of the game if you choose Carl’s Juniors over one of the others. The fact that the “low carb” lettuce wrapped burger is listed on their normal menu also gives them points with me. Although it may not be what you typically consider fast “food”, one other option for a quick on the go paleo compliant snack is grabbing a fresh pressed vegetable and/or fruit juice. While not extremely filling, fresh pressed vegetable/fruit juice can be a great interim option to grab on the go to help you avoid feeling starved until you are able to make or find a fully paleo meal. With fresh pressed juice becoming so popular over the last several years, finding a place offering freshly made juices is becoming increasingly common, even where it is traditionally difficult to find paleo options such as airports, train stations, food courts and shopping centers. In general, the most paleo compliant recommendation would be to choose fresh juices that are predominantly fresh vegetables rather than fresh fruit to keep the amount of the natural fruit sugar in the juice to a reasonable level. But as a once in a while snack it should be ok. In fact, Dr. Loren Cordain has always approved fresh pressed fruit and vegetable juices as a viable paleo option, while at the same time originally discouraging foods like coffee and alcohol. So even if you go crazy and order only a mix of fresh fruits that should be fine if it’s relatively infrequently. One of the largest chains touting juice and smoothies is Jamba Juice. Until recently Jamba Juice did not offer real fresh pressed juice, instead offering only smoothies with questionable ingredients that I would suggest avoiding. The good news is that they have more recently added raw fresh pressed juice to their product line and offer fresh made vegetable and fruit juices made to order at the majority of their locations. You will have to check with each particular location to see if they have juicing equipment available. But given the large number of Jamba Juice locations nationwide, it is great news that they are now offering paleo friendly fresh squeezed fresh juices. I would recommend asking for a custom juice with the particular vegetable and fruits you would like, as just one more level of confirmation that they are in fact pressing the juice fresh for you on the spot. I might be a bit paranoid but this what I have done when ordering fresh pressed juice at Jamba Juice myself. Hopefully as more people start asking for their fresh pressed juices, the percentage of locations offering juicers and fresh juices will continue to increase. Robeks is another national chain offering fresh squeezed vegetable and fruit juices. Their “fresh squeezed juices” menu is the one you want – like many of the other juice bars, they also offer smoothies and other drinks that are not Paleo. Robeks started on the west coast and so have the most locations in southern california, but now have quite a number of locations nationwide and even abroad. There are even Robeks locations in some airports which is convenient. They continue to expand, which is good news for those of us looking for a quick paleo meal or snack on the go. 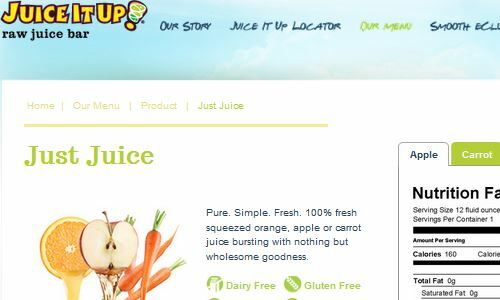 Another large chain offering paleo raw juices to people on the go is Juice it up, also based out of California. 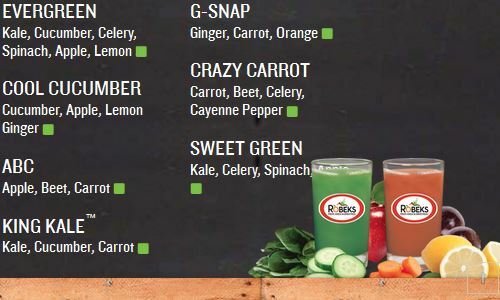 They have recently been emphasizing their raw juice bar menu offered at each of their locations. Although they do not have as large of a selection of fruits and vegetables of some other juice bars, their raw juices are a good option to have. Their fresh squeezed juice is labeled “just juice” and does conform to the paleo diet. Just be sure to avoid their smoothies and get something from their raw juice bar instead. The below group of fast food chains I have seen recommended on forums and by bloggers as good fast food Paleo options. In doing a bit of research, I would say that the options at the below restaurants aren’t great for those keeping strictly Paleo, but I am mentioning what I found so you can make an informed decision for yourself. Panera does have a “secret menu” where they have tailored their menu items for those on special diets. 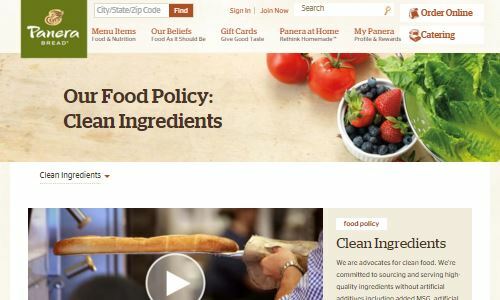 That said, despite several websites mentioning Panera as a good paleo fast food option, their menu offerings are still not fully paleo in most cases, and you will still need to be careful to ask for items without certain ingredients. For example in my research, all of their chicken products as well as their pre-made salad dressings appeared to contain sugar in addition to gums, additives, preservatives and other non-paleo ingredients. So Panera may be an option as a last resort, but probably not the best choice out there for eating paleo, despite some of their claims about “clean” eating. That said, in going through their big menu you may be able to piece together something decently Paleo more easily than at some other places. Classic Salad – Given that the Panera chicken appears to contain sugar, the only salad that appears to be fully sugar free and Paleo is the Panera Classic Salad, without adding the supplied vinegrette dressing, which contains sugar as well. You may need to bring your own dressing or ask for a slice of lemon and olive oil to remain fully paleo at Panera. Jimmy Johns is another often recommended fast food paleo establishment on Paleo blogs and forums. They offer what they call an “Unwich” which is one of their sub sandwiches with a lettuce wrap instead of sub bread and wrapped in their paper to keep everything together. They advertise this option for the low carb community and in theory you can order any of the sandwiches on their menu with this lettuce wrap option. This does not mean these Unwiches are Paleo however. Many of the standard subs contain mayo as an ingredient, an avocado “spread”or other clearly non-Paleo condiments. You would have to ask for your Unwich without all of these ingredients. I had reached out to Jimmy Johns to inquire about some of the ingredients in their condiments, such as their turkey, tuna and tomatoes and cucumbers. They were unwilling to disclose the ingredients in their condiments, citing secret recipes and differences in regional suppliers and were only willing to confirm if one particular ingredient was in a particular item. Given this lack of transparency I am not able to recommend eating at Jimmy Johns if you are trying to keep on a strict Paleo diet. I would definitely choose the Unwich at Jimmy John’s only as a last resort, but it may be a better option than nothing, especially if you are comfortable that some of the ingredients in your food is only mostly Paleo. Although better than McDonalds or Taco Bell I would not typically think of Wendy’s as a great place to go for Paleo food, and it’s not really. But there are a few items you can eat in a bind. They do offer a garden side salad which is all vegetables and as long as you bring your own salad dressing or eat it plain, it should be completely Paleo. There are some other options such as a burger requested with no bun or condiments, but at Wendy’s this will require a custom order. 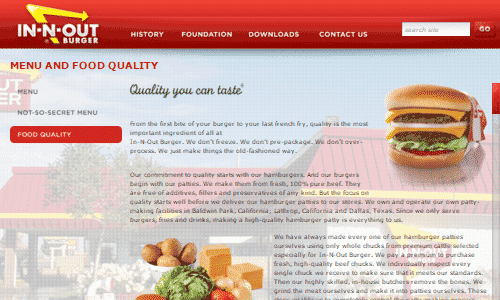 Their beef used in their burger patties is reported to be 100% beef which is promising. But given that it is Wendy’s, there is really no guarantee of the quality or processing methods of any of the ingredients or the use of preservatives, so I would recommend also sticking with Wendys only as a last resort if you really can’t eat anything else. But it is good to know it is an option in a pinch. 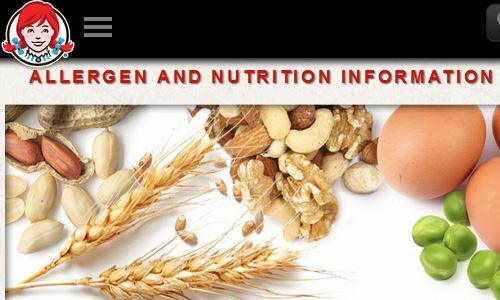 Above we have covered mostly larger chains that are available throughout the U.S. and even internationally that are offering paleo meal items on their menus. The focus on big national chains in the above list is due to trying to give suggestions that are likely to be available in the largest possible number of cities and areas, so that it’s more likely the person reading this article is able to find one of these restaurants when they are having a food emergency. That said, smaller local startups and local individual non-chain restaurants are probably even more likely to offer paleo menu items than big nationwide established chain restaurants. Some examples are the Local Thyme fast casual eatery in NY with paleo symbols to denote paleo meals on their menu. Another is the local, healthy low calorie prepared fast food chain Snap Kitchen in Austin Texas with menu items that are designated as paleo. If you live near or are visiting cities like Denver Colorado, Austin Texas or NYC, we have put together in-depth guides on eating paleo in those cities, with new guides for eating paleo at restaurants in additional cities coming out all of the time. Sometimes finding a local chain offering Paleo friendly options may be your best bet. In addition to fast foods, we’ve written about a number of other convenience foods on the Paleo Diet. Although it’s not always advisable to eat convenience foods constantly, if it makes the difference between you having to go off the diet frequently or being able to stick with it, carefully chosen packaged foods can save a lot of time on a day to day basis. We’ve written articles on sandwich, cassava, banana and flourless breads buns, rolls, salmon and tuna jerky, along with many other snack foods. They might be a starting point in finding store bought Paleo foods. I hope at least a few of these Paleo fast food options were ones you weren’t yet aware of. The goal here was to give you additional emergency food choices for when you are on the road and strapped for time. Paleo eating out is not always pretty, but it’s helpful to know your options so you can make the best possible decisions. If you know of any other great places for Paleo frendly fast food that we didn’t cover here, please share your knowledge in the comments below. We couldn’t have possibly covered everything. We’ll try to profile in depth any of the suggestions contributed. For now, hopefully this gives everyone a good list to get started in navigating the fast food landscape (and landmines).